A well-seasoned cast-iron pan is a treasure. If you put in just a little effort every once in a while to develop and maintain the seasoning of your pan, you’ll be rewarded with one that cooks food perfectly and lasts a lifetime. Cast-iron pans must be maintained because they’re made from a naturally porous surface that, if exposed to water can quickly rust. Left unused in a cupboard, pans may gradually rust from the moisture in the air. The seasoning process fills those pores in the surface of the metal with fat, thus sealing out oxygen and moisture. Then, when baked, the fat forms a bond with the pan that creates a smooth cooking surface that gets better over time. You should season new pans before their first use and I recommend re-seasoning them from time to time to keep them in top condition. 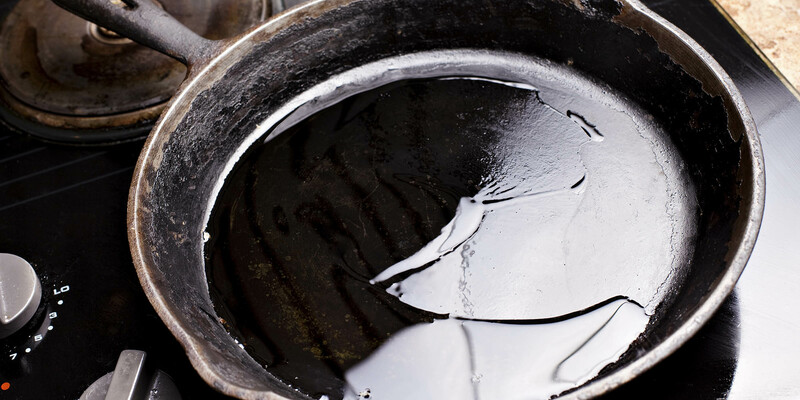 If your pan is very rusty, it can be restored to shiny black, but it may need to be scrubbed several times. If the rust persists, a machine shop can sandblast the rust leaving you with a new, clean surface that is ready to be seasoned. 2. Wash the pan thoroughly with soap and a scouring sponge or brush. Rinse. 7. Admire your beautiful cookware. 8. Follow our instructions for cleaning to protect the pan’s seasoned surface. Repeat this process as often as needed to keep your pan shiny, with a smooth, nonstick surface. If foods start to stick, or if the cooking surface becomes dull or rusted, it’s time to re-season.